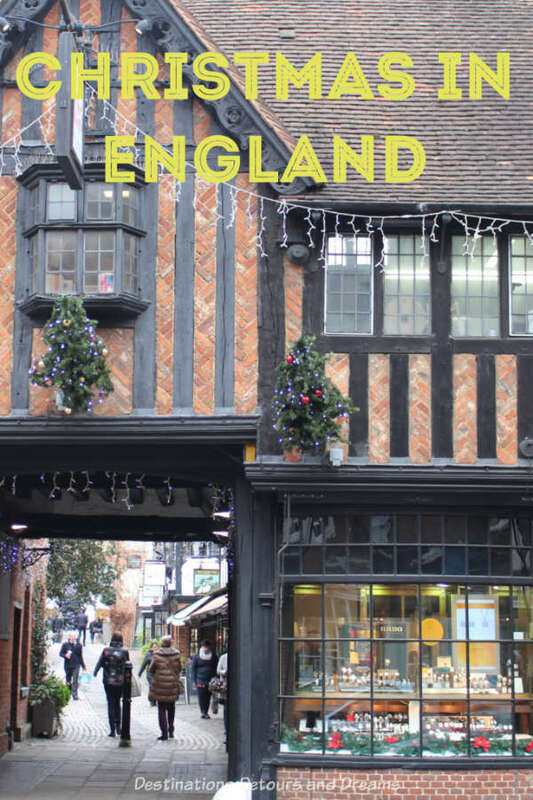 What is it like to spend the Christmas season in England? The Christmas season has always been my favourite holiday time. I treasure many fond memories of that season dating back to my childhood and throughout my adult life. I spent last December in rural England. Canada and England share many Christmas traditions, but there are also variations and differences. It was magical to experience those similarities and differences. 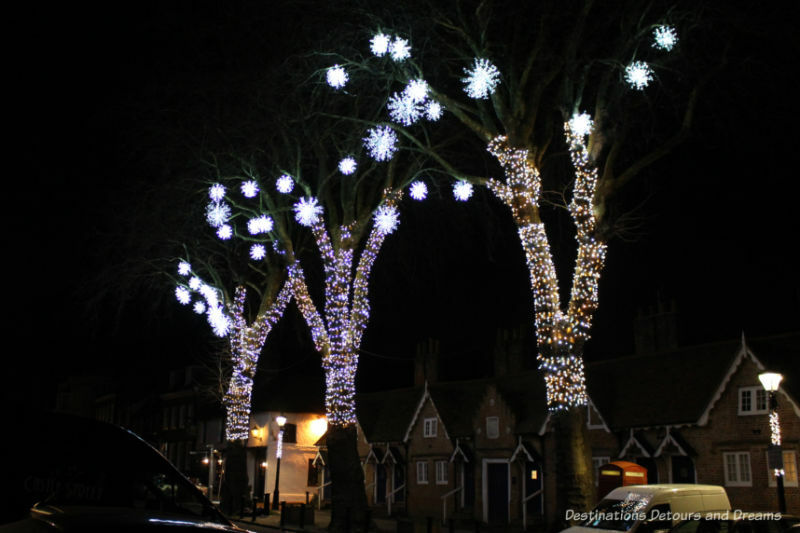 Christmas lights, trees and other decorations are not unique to England. I love seeing houses, streets and businesses in my home city lit up at Christmas. I put up my own decorations. 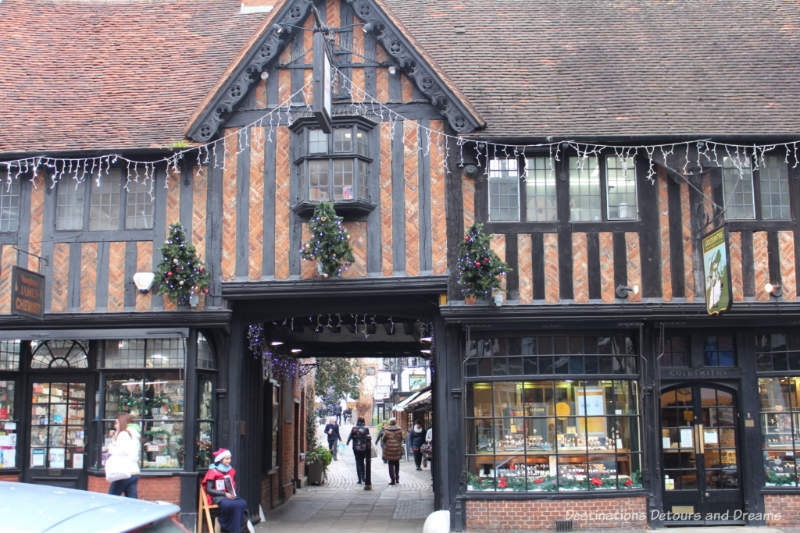 But there was an extra bit of magic in seeing the decorations in England on old Tudor and Georgian buildings, along picturesque High Streets, and in historic market towns. Many palaces and historic stately homes decorate for the season. 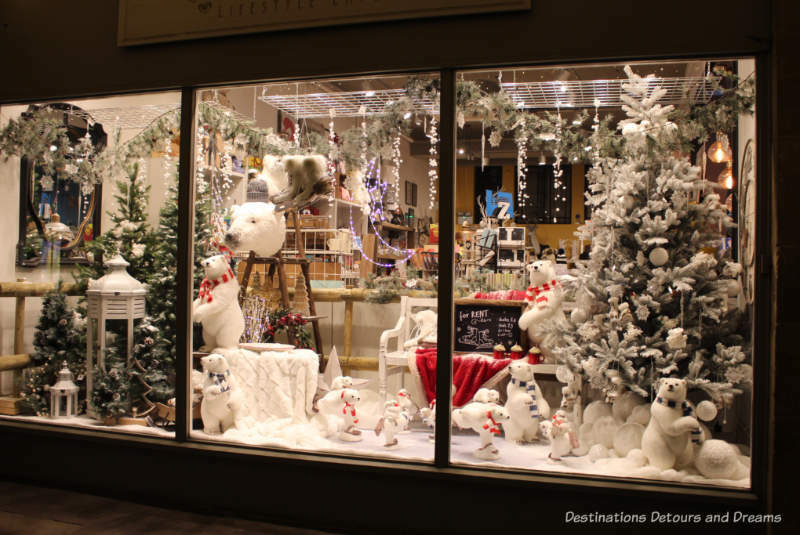 Lavish decorations add a festive air to visits to these places. Sometime the decorations are in keeping with an era portrayed in the home or built around another theme. I visited Petworth House in West Sussex. 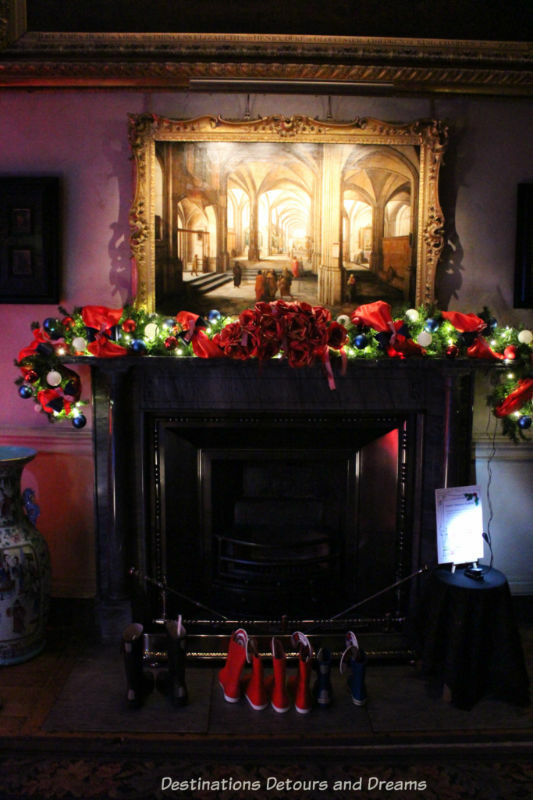 The theme was a Grand European Tour with each room decorated for Christmas in a manner to represent a different country. Petworth House is a 17th century manor house. Although the grand state rooms are impressive in themselves, what sets Petworth apart from other manor homes is its fine art collection, including works by Van Dyck, Turner, Reynolds and Gainsborough. (Unfortunately, the dimmed lighting which worked well to highlight the Christmas decorations made it difficult to fully appreciate the art. I feel I will need to visit again.) This year the stately rooms will reflect a Georgian Christmas. The tradition of exchanging Christmas cards began in England. In 1843, Sir Henry Cole introduced the first commercial card as a way of simplifying the old custom of sending of the Christmas and New Year letter. Cole was a British civil servant and inventor who had helped establish the Public Records Office (now the Post Office). He was later involved in the Great Exhibition of 1851 and was the first director of the Victoria & Albert Museum. He also wrote children’s books. John Calcott Horsley painted that first Christmas card. The picture depicted a family feast. Side panels contained pictures of people caring for the poor. The card created controversy in some quarters because it showed a child taking a sip of wine. The card was sold for a shilling (one-twentieth of a pound), which was expensive for the day. That first card was not considered a successful commercial venture, but by the 1860s, as printing methods improved, Christmas cards were popular and produced in mass numbers. With the rise of email and Internet communications, the sending of Christmas cards may be on the decline, but over 900 million Christmas cards are still purchased each year in the United Kingdom. I certainly saw many cards for sale and enjoyed browsing through the displays. I enjoy looking through all kinds of British cards. I find them interesting, clever and beautiful. That may be partly because they are different than the cards I see at home, where a small number of major distributors dominates the market. Buying cards where a portion of the sale goes toward a charity seems to be a more pervasive custom in England than in Canada. I came across special charity card shops and signs in other shopping areas advertising charity cards. The first charity Christmas card was produced by UNICEF in 1949. 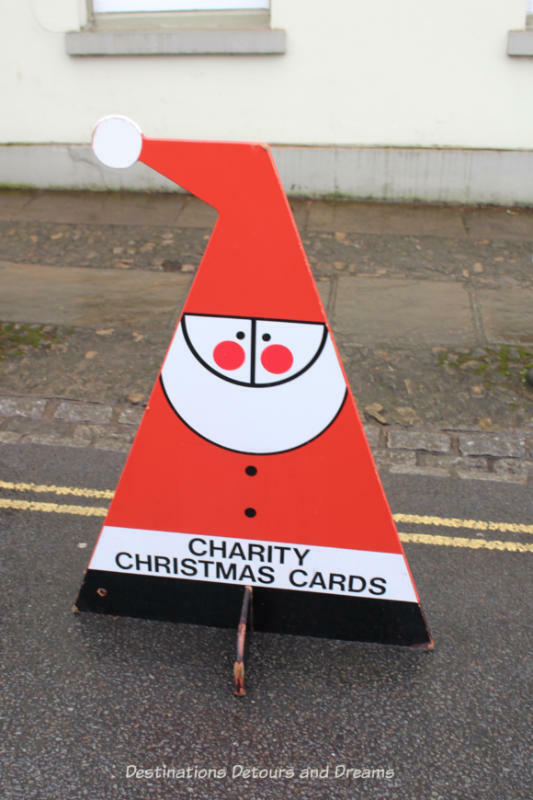 British charities now estimate that £50 million is raised through the sales of charity Christmas cards each year. Even major supermarket chains stock charity cards, although consumers need to be aware that the percentage of those sales going to charity is quite low. 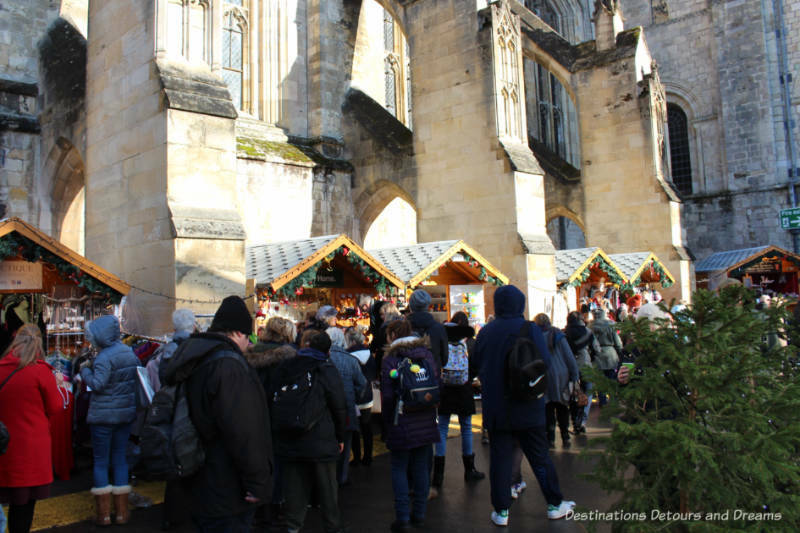 German-style Christmas markets with wooden chalet-style stalls have been a European tradition since their origin in medieval Germany, but they are relatively new in England, dating only to the 1980s. 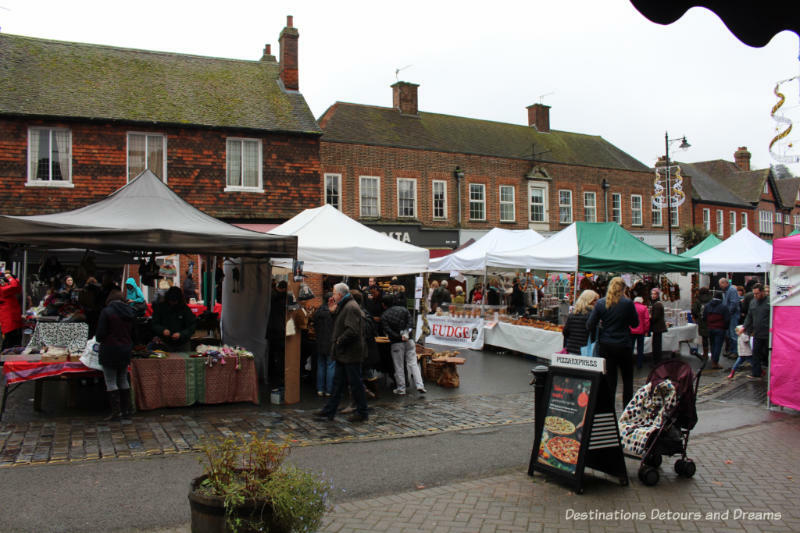 Despite their short history, there are several good European-style Christmas markets throughout England. These markets are usually open for several weeks before Christmas. 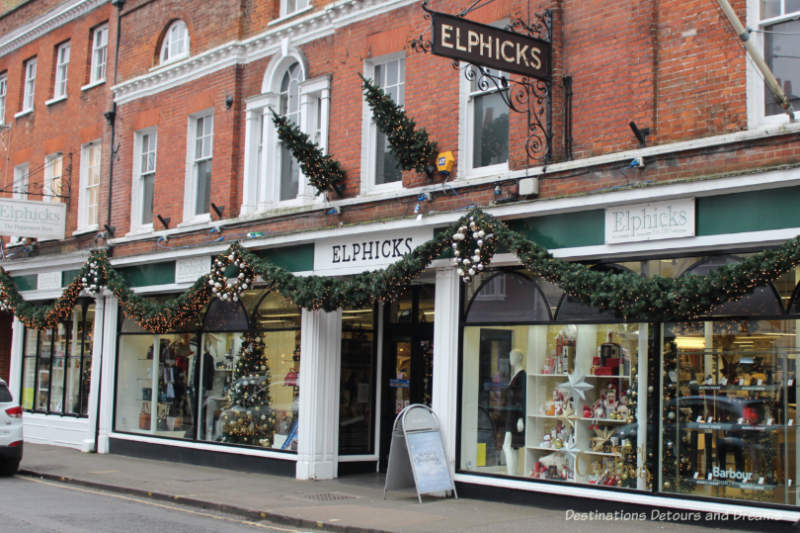 I visited one of these in Winchester, where the stalls were located on the grounds of Winchester Cathedral. Birmingham, Manchester, Bath, Liverpool, Kingston-upon-Thames, and London’s Southbank area are a few other places with significant Christmas markets. Although the German-style markets may be relatively new, England’s market history is centuries old. Many towns and villages host one to four-day Christmas markets. Stalls offering a variety of goods, including many craft items, and a dazzling array of food products, line village streets. 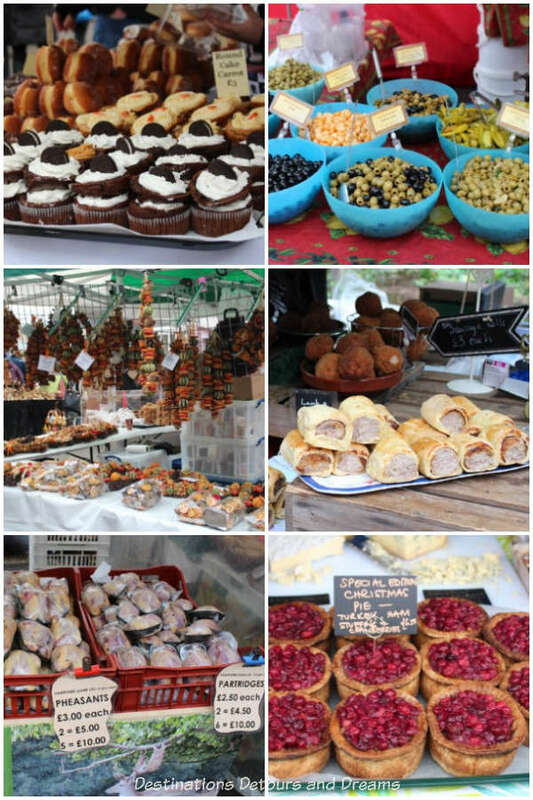 I visited one such market in Haslemere, Surrey. Both types of markets were delightful to walk through and something of a novelty for me. Christmas markets in my home city of Winnipeg, Canada are held indoors due to weather conditions. Carol singing is integral to the English Christmas in a deeper way than in Canada. Although carols and Christmas songs play on sound systems in shopping centres for weeks leading up to Christmas in Canada, events where ordinary voices join in the singing are few. 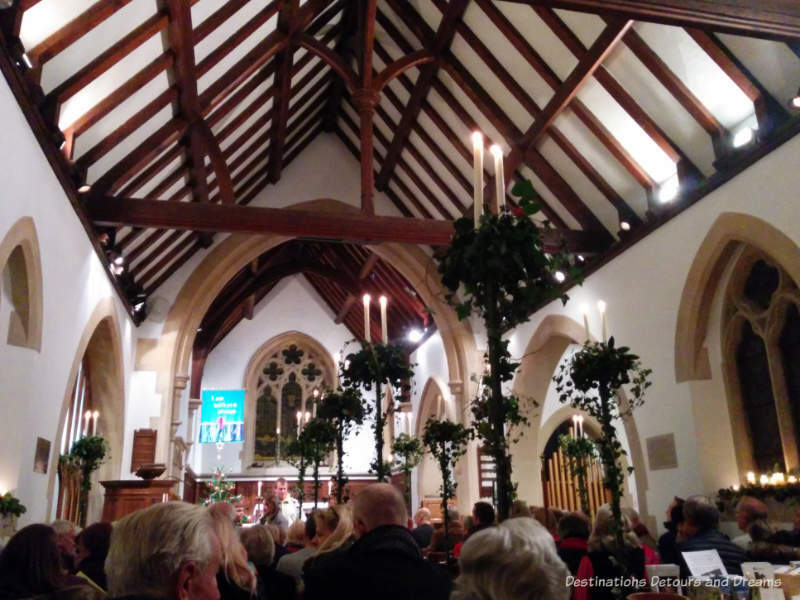 In England, most churches offer special carol services. Village community centres host carol singing evenings. Carol singing events are organized on village greens, often accompanied by candlelight. Some pubs also host carol singing nights. 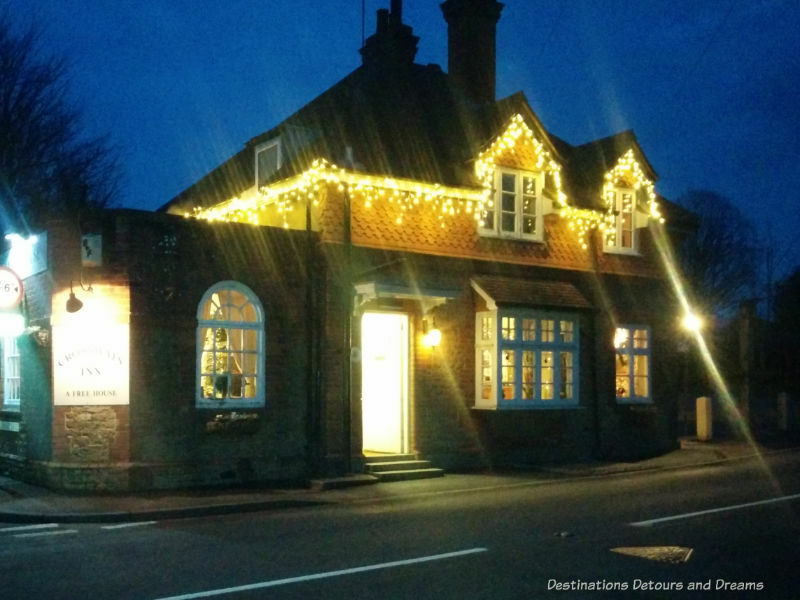 We attended a carol singing evening at the local village pub and a carol service at the local church. Both were enjoyable, albeit different. There was a lot of laughter at the pub event. Popular Christmas songs were included as well as traditional religious carols. It was only the religious carols sung at the more serious, but beautiful, candlelit service at church. The songs at both events were mostly familiar, although a couple seem to be more common in England than in Canada. “In the Bleak Midwinter” is a personal favourite I don’t hear very often at home, but it seemed to be a standard in England. The tune used in “O Little Town of Bethlehem” was slightly different than the one I was used to. One or two popular Christmas songs were completely new to me and to my husband. Pantomime is a British Christmas season tradition. 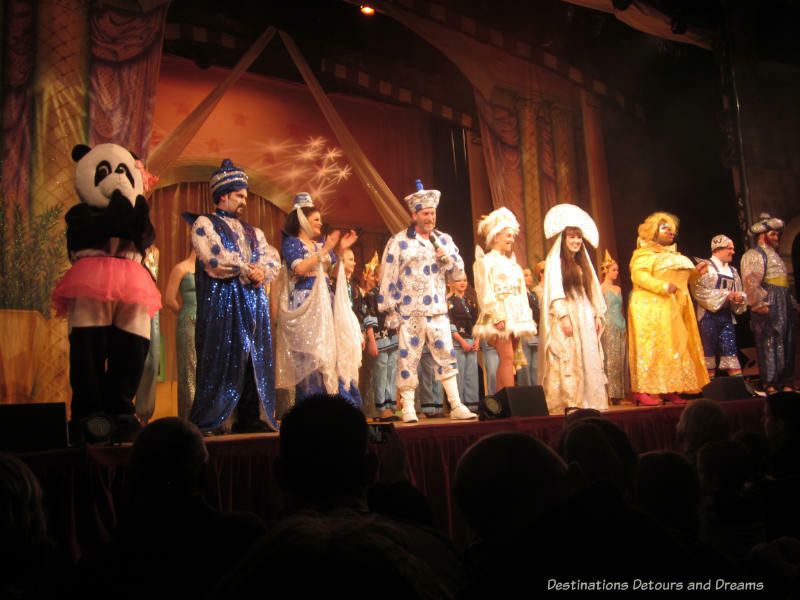 “Panto” is a form of musical comedy family theatre that incorporates song, dance, jokes, cross-dressing actors, slapstick, and audience participation. The play is usually based on a traditional children’s story. I attended my first pantomime during my English Christmas. It was a version of Aladdin featuring a big-boned man playing Aladdin’s mother, a petite woman playing Aladdin, a policeman named “Poo” (and associated corny jokes), a Bollywood number, zombies, many boos and hisses from the audience, and a revised version of the Twelve Days of Christmas with singers racing to catch a rubber chicken and shooting water guns into the audience. Most of the other adults of our age were accompanied by grandchildren, but there were a few other unaccompanied adults in the audience. We laughed as much at the children’s reactions, especially the young boy who almost climbed onto the stage to warn the actors about the zombies, as the play’s jokes. It was all a lot of silly fun. 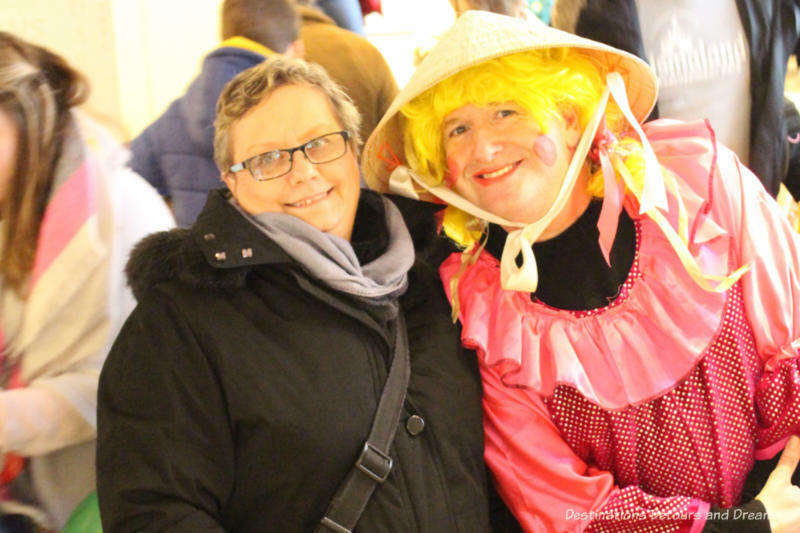 Posing with a panto actor at the Haslemere Christmas market. He was promoting an upcoming village amateur theatre group’s pantomime. Pantomime season usually runs from late November to the end of February. Most professional pantomimes run through the Christmas season. Many village amateur theatre companies stage pantomimes. Those appeared to be mainly scheduled in January or February. 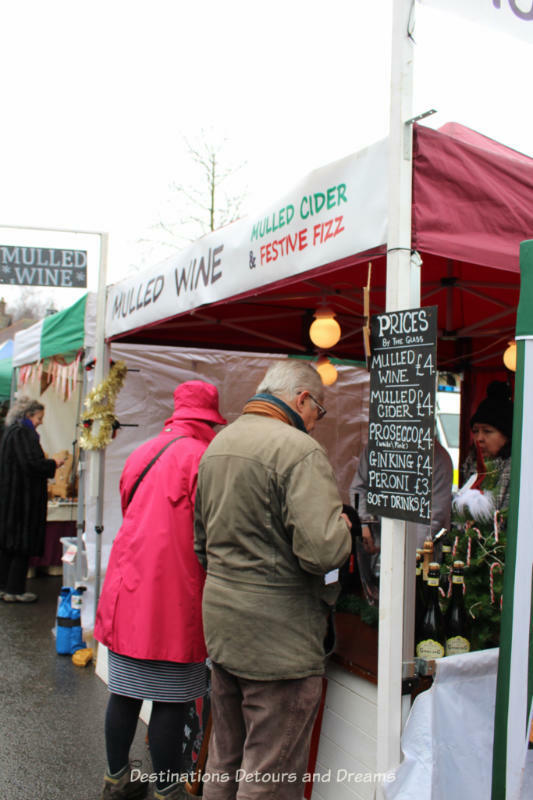 Mulled wine and mince pie are served at most of the events throughout the season, from markets to carol singing events to craft fairs to pantomime performances. 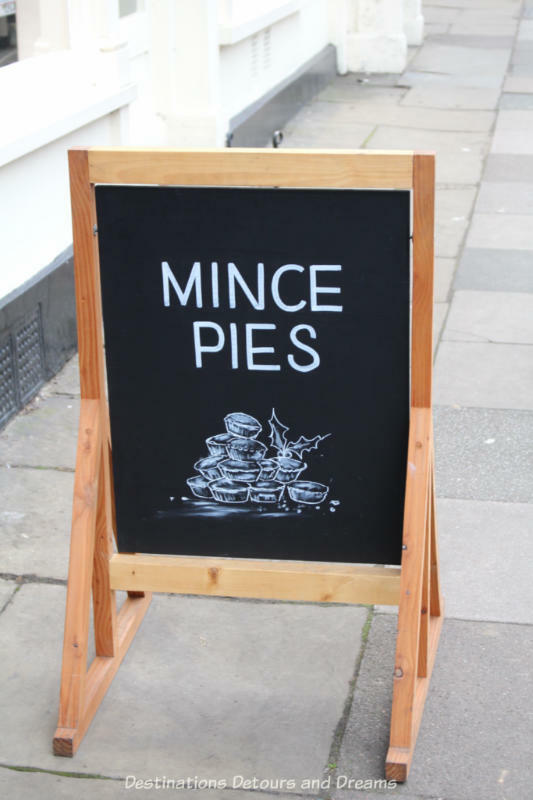 Mince pie is a pastry stuffed with “mincemeat”, a stewed mixture of dried fruit and spices. I have never been a fan of mincemeat but came to appreciate it more after my English Christmas. There are many variations to the recipe and I found some to be quite tasty. Like Canada, Christmas Day is mostly about dinner with family. Turkey is most often served, but the meal may also be goose or roast beef with Yorkshire pudding. Vegetables are most likely brussel sprouts and/or parsnips. Plum pudding with brandy sauce, often served flambé, is the traditional dessert. Traditionally the plum pudding is made a week before Advent on “stir-up Sunday.” Other possible dessert choices include Christmas cake, trifle, and Yule log. I don’t have a huge sweet tooth, but I was quite taken with the choices of sweets at the local supermarket. 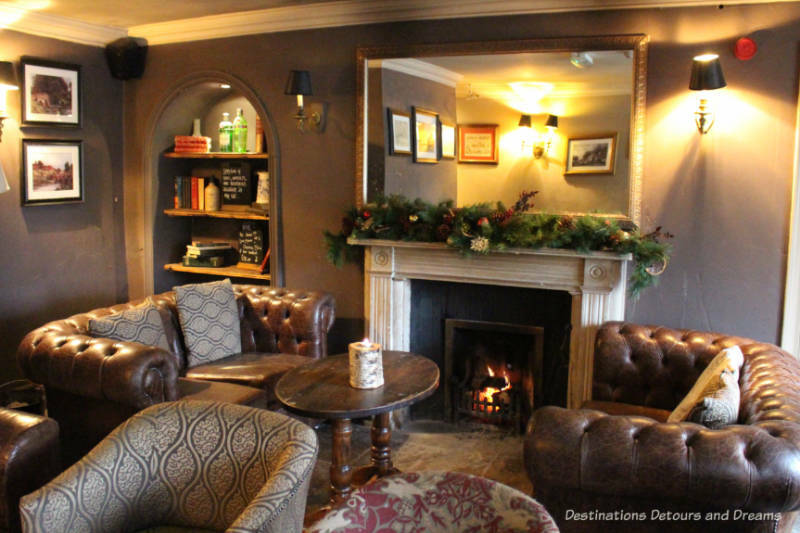 If you’d rather be eating out on Christmas, a number of pubs and restaurants put on Christmas feasts. You need to reserve your spot in advance. Our own Christmas Day was quiet. We watched an array of Christmas specials on the “telly,” including, of course, the Queen’s Christmas Message. As in Canada, the day after Christmas is known as Boxing Day and is a holiday. I’ve heard a couple of possible origins for the day and its name. The most widely used explanation is that it was traditionally a day off for servants and when they received a “Christmas box” of gifts from their masters. Another explanation is that boxes to collect money for the poor were placed in churches on Christmas and opened the next day. As in Canada, shopping is an English Boxing Day activity, although this is a more recent “tradition”. Stores in major centres hold Boxing Day Sales. Stores in smaller centres and villages are closed. People participate in other Boxing Day traditions, such as going to the horse races. A very old Boxing Day tradition, less common these days because it is very controversial, is fox hunting. 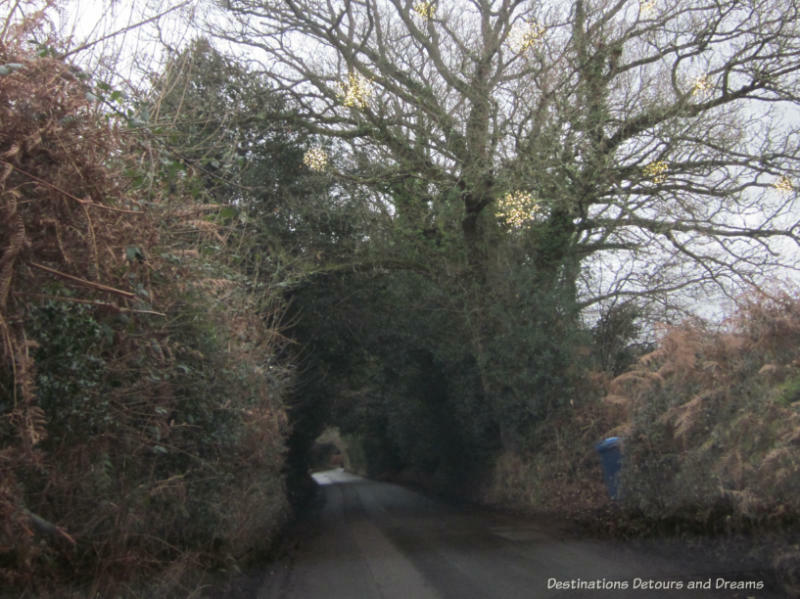 A Boxing Day tradition still very alive and well is a walk in the countryside. We generally took the two dogs we were sitting to a heath about a five minute drive away from us for their daily walks. It was usually quite quiet. On Boxing Day, it was bustling and the car park was full. Being away from home during a holiday season can sometimes feel lonely and disorienting, but experiencing the traditions of another place, both those that feel familiar and those that are not, can be very enjoyable and make you realize there are many ways to celebrate. A lovely post. It certainly set the stage to start thinking about Christmas. Thanks Eva. Writing it made me want to be there again this year. Compared to the U.S., or at least the part of it where I live, the holiday decor seems a bit more tasteful and artistic. Also, carolers are few and far between here. While I’m not British, I still look forward to a Boxing Day of sitting in front of the TV watching English soccer. Ken, surely you mean “football”! 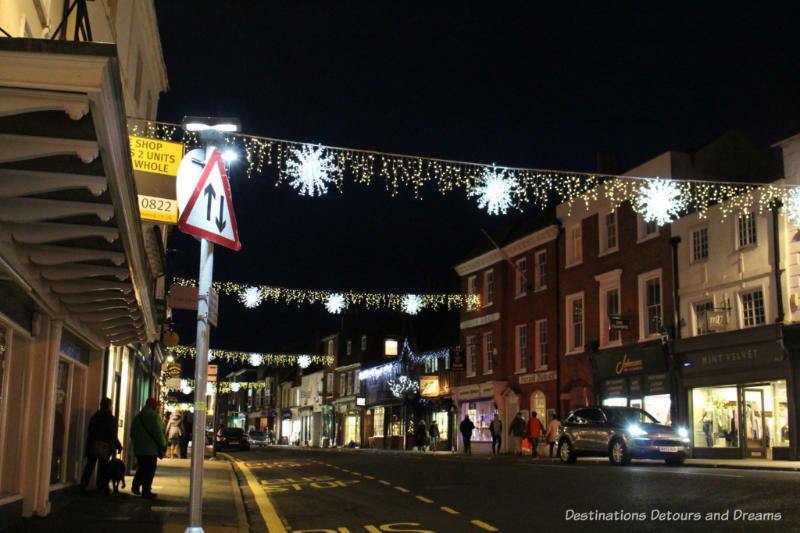 I l love Christmas decoration in general and enjoyed the ones I saw in the area of England we were in.